Although it is not unusual for me to burn the midnight oil, this week has seen me stay up late to create every night. And I mean really late - I think I may have found those 50 hours. It was worth it. I have finished the Little Folks Quilt and am super pleased with it. It is so soft and dreamy, and drapes so beautifully. Even when you fold it, the creases just fall out. Piecing with the voile fabrics was daunting at first, but my fears were very much unfounded. I used a little spray starch to settle the edges when piecing together the long strips of fabric. (Remember Little Folks Voile is extra wide at 55 inches). This ensured that the strips did not stretch or curve. 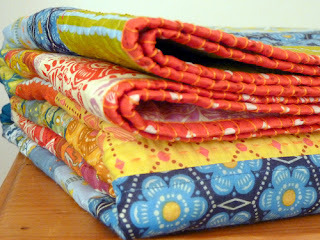 I was also pleasantly surprised to discover that machine quilting voile fabrics was a not as difficult as anticipated. As the fabrics are smooth and slippery they cause less friction and move through the sewing machine easily, gliding effortlessly. What I did do was change to a thinner needle, using a Microtex 60/8 needle. This is a sharp needle suitable for lightweight and fine fibers. No broken needles to report. 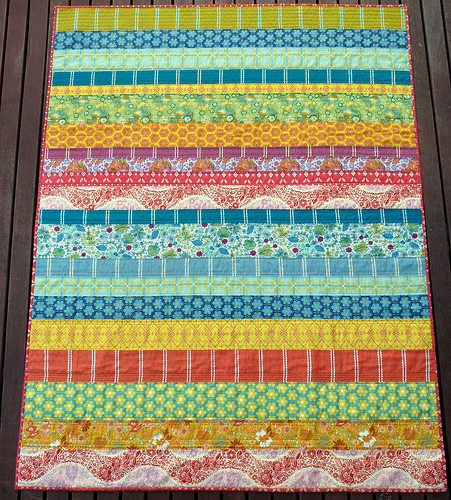 The back of the quilt is also a voile fabric from the Little Folks range by Anna Maria Horner. I think having used all lightweight voile fabrics for both the front and back of the quilt certainly helped make the decorative hand stitching a little easier, with the needle gliding through quite happily. The binding fabric is again more voile, and similar to the inspiration quilt, I used perle cotton to blanket stitch around the top and bottom edge of the binding (although I think I may have done it upside down?). It adds a touch of interest and a feel of luxury. Lots of pictures here today, but my words alone are insufficient in describing this quilt. As you can see I have enjoyed every single quiet moment late into the night. This is a work of art Rita - well worth the late nights. The blanket stitching is such a beautiful touch. I *love* the blanket stitching on the biding - such a great idea. It's breathtaking Rita. I love EVERYTHING about it. It's beautiful! 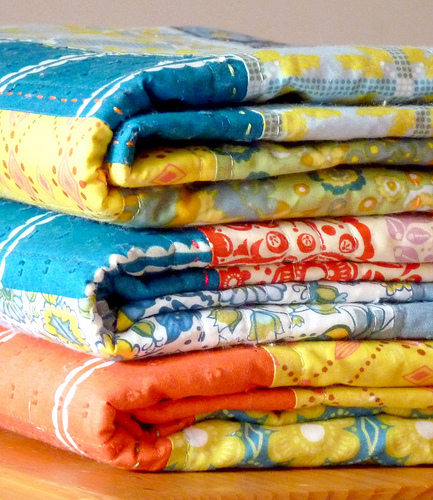 I need to get my hands on that soft fabric :) Love your hand quilting. wow, it is truly gorgeous! 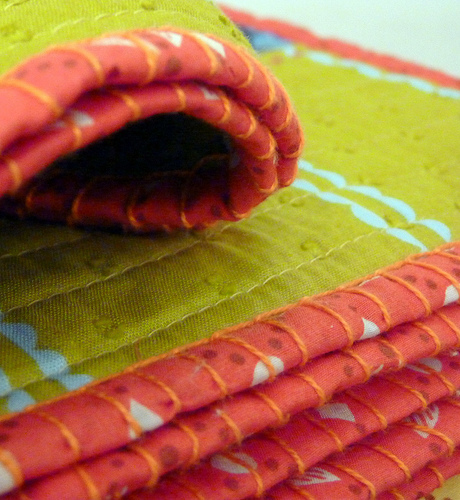 i am in love with your hand quilting--perfect! It is beautiful! The hand-stitching on the binding is amazing, I am completely in awe!! The blanket stitching on the binding is beautiful! Awesome quilt, awesome ideas! That is absolutely gorgeous. Do you have quilters fingers? I just started quilting and have been doing some hand quilting and the middle fingers on each hand have turned into pin cushions, they're so full of holes! Rita that quilt is just perfect. 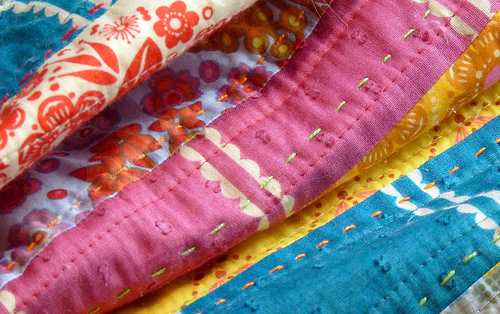 Such great fabric put together so well and then hand quilted gorgeously. I did not know you could do that with quilt binding, but what a great idea. Love it to bits , the hand stitching is really lovely . Another absolutely stunning quilt, I love it! Fabulous hand quilting too. Just beautiful! Looks very inviting! That looks fabulous! 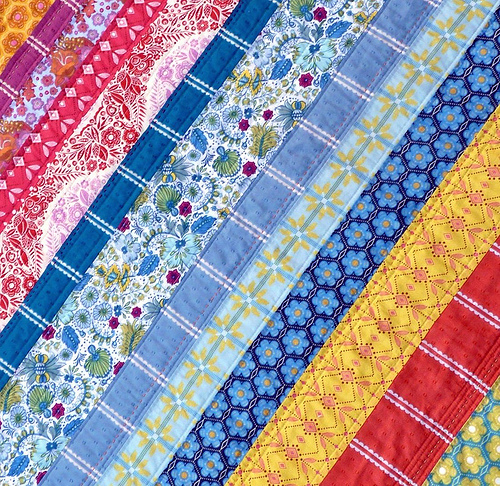 I keep staring at my huge pile of voiles and wondering exactly what to do with them, and I love the idea of a bit of hand quilting to show of even more colour and life. I adore it. Absolutely adore it. And that stitching around the binding? Genius. This is just stunning!!! Wow. This is absolutely gorgeous! 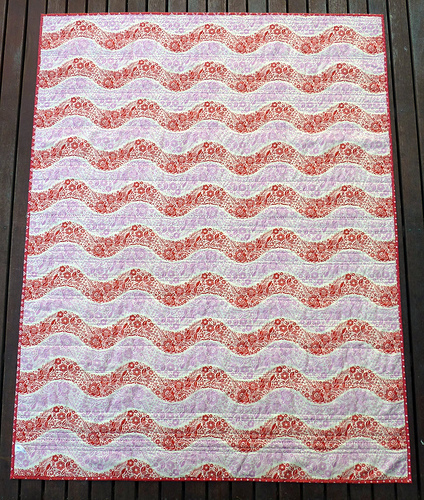 I have some AMH voile and have been thinking of using it for a quilt - thanks for the inspiration! You are meticulous about every detail, and it shows! Beautiful work! Rita, Like everyone else, I think this is one very gorgeous quilt! Thanks for the inspiration. I think I need to buy me some of that voile---like right now. So beautiful! Completely understand your need to photograph it every which way, I can hardly take my eyes off it! And LOVE all the hand stitching - makes it even more special. do you mind sharing how wide some of the strips are? Just to make sure - you did the binding as usual and THEN added the blanket stiches, right? Stunning. And the binding is amazing! I am in love with the AMH voiles too! 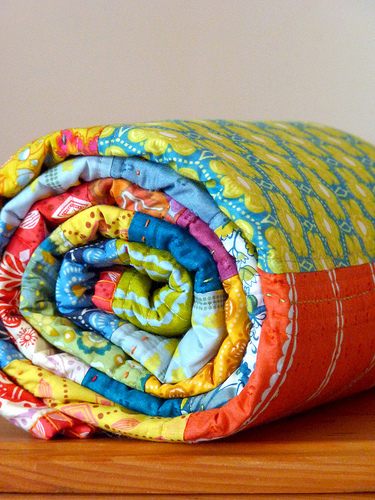 This quilt is so beautiful, I love the binding! Yes, the blanket stitch is usually done the other way around, but the way you used it here is different and cool. I'm sure it gives the binding a fun texture. All the pictures are lovely. Thanks for sharing! It is indeed lovely and your photos show how easily it drapes. I've done a blanket stitch on a wallhanging binding before and it does indeed dress up the quilt and give it a luxurious finish! Beautiful work! That is absolutely gorgeous! WOW!!! And, you're right...there are many more hours in the quiet of the night. I used to not work outside of the home and it's unbelievable how much one gets done with absolutely no interruptions! It turned out SO beautiful and the hand stitching is such a wonderful touch. This is truly an heirloom quilt. I want to touch it! Rita, this is so wonderful. I don't know how you can bear to part with your quilts. They're just so.....divine! Well done. Very beautiful. One of the nicest you've made. It is so beautiful Rita! Beautiful...you should keep it for your Mothers Day! Very beautiful! 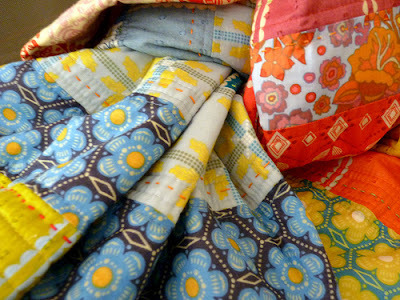 :) I imagine the light-weight nature of the quilt will be perfect for spring mornings, or summer mornings. Great idea! :) I love all the pictures. What kind of batting did you pair with the voile? Hi Andy - the batting I used is Matilda's Own 100% cotton. thank you very much for mentioning the batting you used! i was perusing the comments (3 years later) for that very info. our summers are HOT and humid and i want to make a quilt that won't smother us. your AMH quilt is so lovely! you always do such a great job pairing colors! It's wonderful. I just want to hug it! OK, so I don't throw this type of expression out there very often, but...OMG!!! I want to climb inside this screen and wrap it around me. No need for words on this post, the wonderful photos say everything - it is just amazing! My fav, no doubt!!! I am in awe of the blanket stitch here around the outside edge. I just learned how to do the slipstitch to bind the back and I love IT!! Thank you so much for ALL your pics and insight! It's lovely and I love the extra interest of the perle cotton. If there was 50 hours in a night, I could sleep during the day and be up all night, maybe. Awesome, awesome! Thanks for sharing. It's one beautiful quilt. I like to sew during the late hours too. Nice and quiet, no interruptions. Good thinking time. This is so stinkin' cute! Thank you for sharing! Keep up the fabulous work! Great colors, stripes, stripes, stripes, great idea.